Blyth Spartans secured back to back away wins for the first time since December 2017 thanks to a brace from Dan Maguire and Aaron Cunningham’s first goal for the club. The Hartlepool United loanee netted inside three minutes to give Spartans the lead before Kingsley James responded on 19 minutes from the penalty spot. Dan Maguire restored the lead 10 minutes before the end of the first half, adding his second and Spartans third nine minutes from time. Three days after the 1-0 win away at Southport, Alun Armstrong made three three chances, inserting Kieran Green, Jarrett Rivers and Louis Laing in place of Reid, Wrightson and Jordan Watson. But it was Cunningham – starting his second consecutive game at right back – who opened the scoring. Robbie Dale’s left wing cross was punched away by Joe Green straight to Cunningham who lashed home on the half volley. Spartans continued to control the game in the opening salvos, but a majestic run by Will Hatfield saw Kieran Green bring him down in the penalty area. James stepped up a duly netted past Jameson – the ‘keeper unable to replicate his heroics against York City. 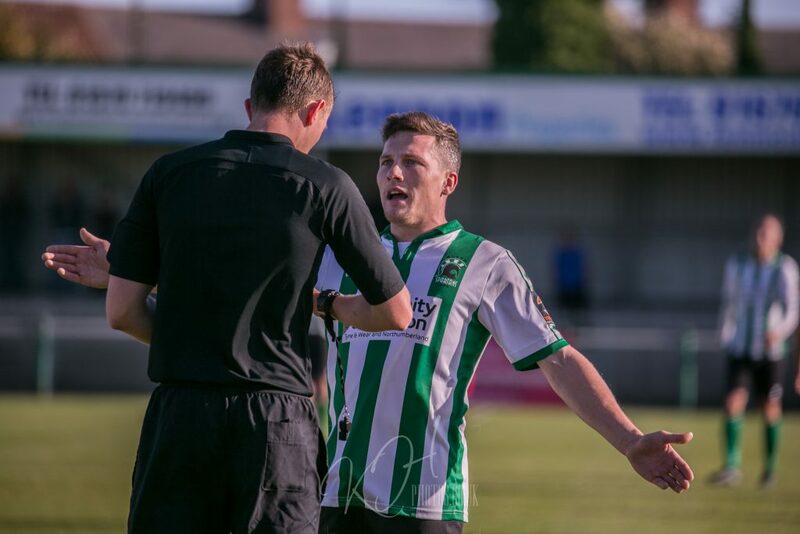 Despite the setback, Blyth continued to put pressure on the Lions goal, but were unable to really test Joe Green until 10 minutes before the break. A route one ball was flicked into the path of Maguire who battled past a Guiseley centre-half before unleashing a half volley on the stretch into the bottom right hand corner, a stunning finish to bring up his 140th goal for the club. The hosts had the ball in net within 60 seconds, however, as James broke through the Spartans defense and finished confidently – unfortunately for the Lions his run drew the offside flag from the referee’s assistant. The second half continued in a similar vein to the first – the hosts unable to breakdown a Spartans side gaining in confidence. The only effort on target in the entire second half saw Jameson deny Kayode Odejayi with a smart stop from an acute effort from the left. Maguire was proving to be a huge nuisance for the Lions and doubled his tally with 9 minutes remaining. The England ‘C’ International broke down the right hand side before calmly stepping past two defender and rolling the ball into the bottom left hand corner from 18 yards out, a stunning finish. The result takes Spartans up to 17th in the National League North, just four points from the top half of the table. Next up is a home game against FC United of Manchester this coming Saturday. Spartans | Jameson, Cunningham, Liddle, Oliver, Buddle, Laing, Rivers (Wrightson 90), Mullen, Maguire (Fewster 83), Green (Reid 72), Dale. Guiseley | J Green, Moyo, Heaton, Purver, Thornton, Cummings, Walters (Felix 56), James, Odejayi (Clayton 85), Hatfield (Smith 74), Morrison.